FULFILL AND CARRY FORWARD THE TASKS OF THE SECOND PROPAGANDA MOVEMENT TO ADVANCE THE NATIONAL DEMOCRATIC REVOLUTION! The National Democratic Front of the Philippines – Mindanao salutes all the members as well as the heroes and martyrs of the Kabataang Makabayan (KM) on the occasion of its 46th founding anniversary. KM student/youth contingent in a Manila protest against the repressive actions of the US-backed Marcos regime in the early 1970s. When Marcos declared martial law in 1972, the KM went underground and many of its members joined the Communist Party of the Philippines and the New People's Army's guerilla fronts. Andres Bonifacio, one of the great revolutionary leaders, whose 101st birth date was chosen to be the founding date of KM, must have been proud to see the sons and daughters of the revolution today carrying onward with fervent and vigor the aspirations of the Filipino people to be free from the clutches of oppression and exploitation by foreign power and its local agents. Map of Mindanao in the southern Philippines. The boxed area is where the Moro population is concentrated. As you can see from the inset map, the Philippines occupies a strategic location for US war planning aimed at countering the increasing projection of military power in Asia by the Chinese imperialists. [Some background to this press release and the revolutionary movement in the Philippines: The New People’s Army is the military arm of the Communist Party of the Philippines, which has over 100 guerilla fronts in all of the 11 major islands of the Philippines. 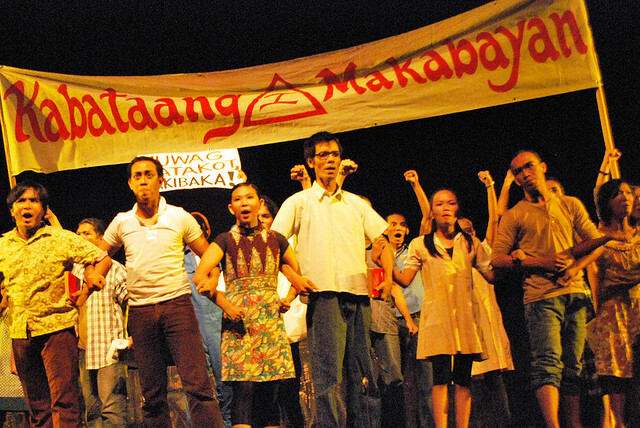 The CPP/NPA has established People’s Democratic Governments in many of these fronts. 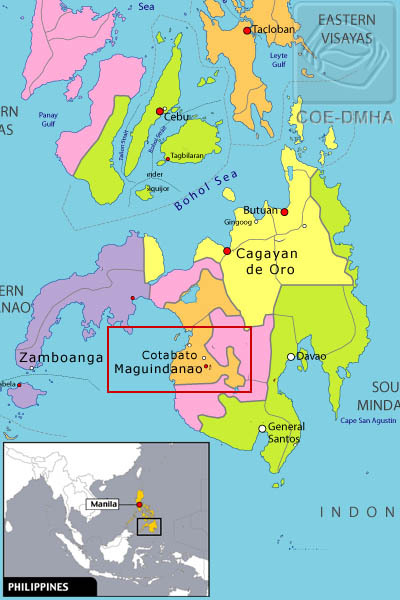 The Compostela Valley guerilla zone mentioned in this press release is an area in southeast Mindanao, one of the two largest islands in the Philippines. The Moro people are the oppressed Muslim people who live in large parts of Mindanao and the islands south of Mindanao. The AFP is the Armed Forces of the Philippines, which conducts brutal military operations against the NPA and its popular base of support according to US counter-insurgency military doctrine. The AFP receives hundreds of millions of dollars in US military aid annually, conducts regular “joint exercises” with US marines and naval forces, and receives training from US Special Forces units who operate out of a US military base in Zamboanga, Mindanao. The Merardo Arce Command-Southern Mindanao Regional Operations Command of the New People’s Army has ordered the release of Cpl. Daiem Amsali Hadjaie of the 25th Infantry Battalion of the 10th Infantry Division-Armed Forces of the Philippines (Serial No. 813144) after 12 days of captivity as prisoner of war of the Conrado Heredia Command-Front 20 Operations Command-NPA. The CHC-NPA custodial unit undertakes POW Cpl. Hadjaie’s safe and orderly release today, 28 November, in the guerilla territory in Compostela Valley Province. On August 29th, 2010, Reporters Without Borders Washington DC representative Clothilde Le Coz visited Mumia Abu-Jamal, prisoner on death row for nearly three decades. The meeting took place in room 17 of the State Correctional Institution (SCI) in Waynesburg, Greene County, Pennsylvania. Reporters Without Borders: As a journalist who continues to work in prison, what are your latest reports focused on? 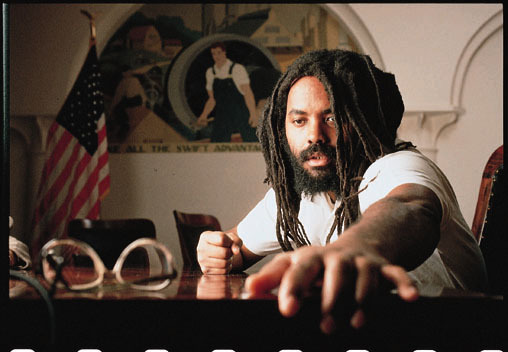 Mumia Abu-Jamal: The prison population in the United States is the highest in the world. Over the past year, for the first time in 38 years, the prison population declined. Some states, like California or Michigan, are taking fewer prisoners because of overcrowding. State budgets are restrained and some prisoners are released because of the economic situation. Prisons in America are vast and the number of prisoners is immense. It’s impressive to see how much money is spent by the US government and how invisible we are. No one knows. Most people don’t care. Some journalists report when there is a drama in prison and think they know about it. But this is not real : it is sensationalist. You can find some good writings. But they are unrealistic. My reporting is what I have seen with my eyes and what people told me. It is real. My reporting has to do with my reality. They mostly have been focusing on death row and prison. I wish it were not so. There is a spate of suicides on death row in the last year and a half. But this is invisible. I broke stories about suicide because it happened on my block. Saudi Arabia (TML) – An international human rights group has called on Arab countries to better protect their foreign domestic workers, following recurring reports of abuse suffered by Asian maids.A Sri-Lankan housemaid working in Jordan told Human Rights Watch that her employer forced her to swallow nails, while another, employed in Kuwait, claimed her employer drove nails into her body. Fleeing extreme poverty and harsh living conditions, millions of migrant domestic workers from across Asia and Africa flock to the oil-rich Persian Gulf. Leaving underdeveloped countries such as Sri Lanka, the Philippines, Nepal and Ethiopia, the workers seek higher salaries which they send home as remittances. However, higher wages often come at a high cost in human rights abuses and labor violations. Challenged by Senior Vice-chairman Mohan Baidya and Bhattarai simultaneously, Chairman Dahal was pushed into a defensive position. Both the vice-chairmen, who represent two extreme and opposite ideological lines, not only attacked his “centrist line”, but also accused him of misusing “power, authority and finances” to increase his hold on the party. The sixth plenum turned out to be different from those in the past as both Bhattarai and Baidya abandoned their support for Dahal simultaneously, and the two-way intra-party conflict of the past turned triangular. 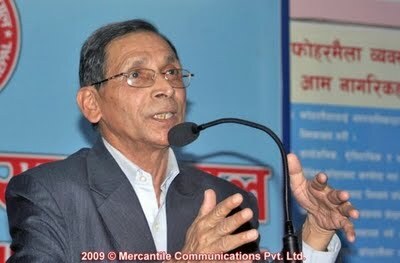 Without the support of Baidya or Bhattarai, the Maoist chairman appeared weak as never before. 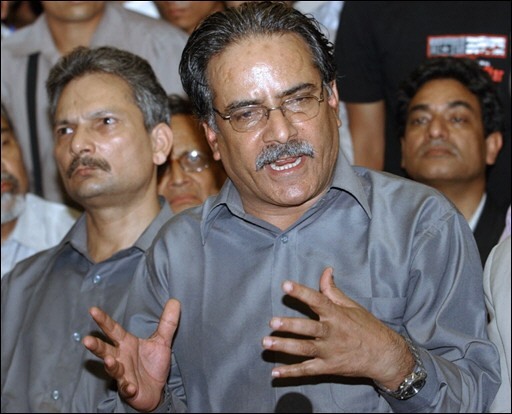 Result: the sixth plenum rejected Dahal´s synthesized political document. Bhattarai had sharp differences with Dahal on the issue of naming the party´s principal enemy, though both leaders shared the ideological view that the party should work to institutionalize the political achievements made so far. While Dahal stated that India should be declared the party´s principal enemy, Bhattarai had argued that the party should first defeat “domestic feudalism” instead of launching struggles against India. “We could not agree with the chairman as he prepared his synthesized document, mixing dissimilar ideas. It is an act of eclecticism,” says Maoist leader Ram Karki, who is close to Bhattarai. The Maoist chairman had hoped that he would get the support of Baidya as he had accommodated most of the latter´s views in his synthesized document. The meeting showed that Dahal is also losing his grip on the Maoist People´s Liberation Army (PLA), which is still indirectly headed by Dahal himself. But Baidya appeared more aggressive than Bhattarai against Dahal. Baidya, who leads the hard-line camp in the party, attacked Dahal for not launching a “people´s revolt” to establish a “People´s Federal Democratic Republic” in Nepal, the line passed by the Kharipati national conclave. He even threatened to take over the party leadership. “We could not agree with the chairman as we not only had sharp ideological differences, but we also saw a gap between the chairman´s words and what he has been doing in practice,” says Maoist leader Khadga Viswakarma, who is close to Baidya.